The Meadows were gracious hosts to the third RUAS Qualifier for the forthcoming Balmoral Show. In what was a bumper entry of a day, jumping in Arena 1 continued well into the early evening. In the first class of the day, 70 amateurs ventured to the Arena, of these 23 combinations made it through to a jump off. The course, designed by Aaron McCusker and maintained by Alan Lynch, saw a flowing jump off with many opportunities to cut time from the clock. In the end it was Jacqui Boland that was to prove victorious with her horse Maverick Na Ri, securing that all important spot at the Royal Ulster Agriculture Society Show in May. The next class taking place in Arena 1 was the 5-Year-Old Qualifier. As expected there was a large contingent of experienced local riders contesting this round and as a result, the 11 combinations that proceeded to the jump-off only had a win in mind. Winning the class was Jonathan Creswell, with Brian McLaughlin’s ‘Lincourt Quality’, the grey mare by OBOS Quality 004 jumped a foot perfect round, to take the win in 36.14 seconds. With competition hotting up in Arena 1, the six and seven-year-old Horses didn’t disappoint, Virginia native, Natasha Carolan proved popular as she piloted her own Dallas VDL Mare ‘Impluss’ to victory in the SERE Autos sponsored event. Carolan stopped the clock in 50.50, less than two tenths of a second ahead of regular supporter Edward Little, who finished in second place with Heather Crawford’s HSC Sunny Jim, a gelding by Pacino out of a Conquistador mare. In the final competition in Arena 1, and with the sun beginning to set, it was the turn off the 1.35m Horses who wished to qualify for the 1.35m National Grand Prix at Balmoral. Following recent international duty, Harry Marshall was the only rider to go doubled handed into the jump-off. First to go with ‘First Vendi’, Marshall put it up to the rest when he delivered a faultless performance in 33.05 seconds, which later as it turns out was an unassailable target with Simon Scott his closest rival on 33.85. With the RUAS Qualifiers in full swing in Arena 1, SJI Jumping also continued in arena 2. Organisers once again welcomed competitors from near and far, who travelled to compete in the superb facilities of the embankment road centre. Dungannon native and regular attender to the Meadows, Hannah Maneely took the top spot in the 1.20 class with her father Jim’s ‘Amigo Van Het Winkenshof Z’. Maneely was one of only three combinations to remain without fault and with a blistering performance maintained their lead over Mellissa Tinney and Premier Domino. Showjumping continues this weekend with SJI Horse Showjumping returning to Arena 1 and Unregistered Jumping back in Arena 2, with both arenas commencing at 9.30am. 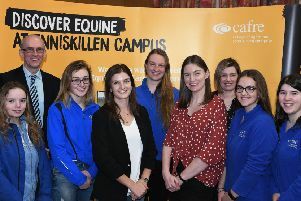 Amateur RUAS Qualifier - 1, Jacqui Boland’s Maverick Na Rí (Jacqui Boland); 2, Aileen McDermott’s Amber Balou (Aileen McDermott); 3, Sarah Kinnear’s Elf Queen (Sarah Kinnear); 4, Darragh McMahon’s Sunnyside Boy (Darragh McMahon); 5, Jade Walsh’s Davino B (Jade Walsh); 6, Taryn McClurkin’s Innocense (Taryn McClurkin); 7, Jayne Clarke’s Emby (Jayne Clarke); 8, Philip White’s Senate Hill (Philip G L White); 9, Ian Moore’s Triple C (Ian Moore); 10= Margaret Fullerton’s Limmerick Jewel (Tom Hogan) and Roisin Blaney’s Seaforde Rebel (Roisin Blaney). Five-Year-Old RUAS Qualifier - 1, Brian McLaughlin’s Lincourt Quality (Jonathan Creswell); 2, Keonan stables Ltd’s Clovalent (Olivia A Roulston); 3, Carol A. McLaughlin’s Calle Cool (Shane McCloskey); 4, Seamus Tighe’s Lough Scur Quality Lady (John Mulligan); 5, Vincent Burton’s Drumrankin Caesar (Shane McCloskey); 6, Deirdre McMordie’s Omard Hawaii Queen (Jonathan Smyth). Six/seven-Year-Old RUAS Qualifier - 1, NKC Sporthorses’ Inpulss (Natasha Carolan); 2, Heather Crawford’s HSC Sunny Jim (Edward Little); 3, Noletta Smyth & Roy Craig’s Mulvin Lights Out (Jonathan Smyth); 4, Siobhan Dunne’s Claddagh Martha (Tara Dunne); 5, Gregory Clarke’s Check Me Z (Ausra Valuckyte); 6, David Gibson’s SGS Welcome Louie (Stephen Gibson). 1.35m RUAS Qualifier - 1, Harry Marshall’s First Verdi (Harry Marshall); 2, Ian Millar’s Ploverfield Lilyana (Simon Scott); 3, Ann Doherty’s Crystal Tom (Jonathan Smyth); 4, Yvonne Whiteside’s Ecclesville (Yvonne Whiteside); 5, Aoife Rafferty’s KMR Benzini (Cormac Rafferty); 6, William Todd’s Roscrib de Ross (Peter Smyth). 90cms - Divided between Paula McLaughlin’s Alamshar Hero Z (Katie McLaughlin), Jim Maneely’s Calcourt Corona (Hannah Maneely), Daniel Douglas’s Carrick Diamond Sue (Peter Douglas), Jane Kealey’s Danny Boy II (Jane Kealey), Rachel Hall’s LKC Miss Cloverfield (Rachel Hall), Sheelagh Canty’s Mr Timmy (Beverley Caves), Ian Moore’s Pinecrcoft Galaxy (Ian Moore), Stephen Gibson’s SGS Pride of the Hill (Stephen Gibson). 1m - Divided between Conor McCabe’s Atlantic Bandit (Conor McCabe), Aileen McDermott’s Amber Deluxe (Aileen McDermott), Louise Houston’s Ballybrack Tom (Louise Houston), Shirley A Hurst’s Cheeky Blonde (Adrianna Hurst), Sarah McLean’s Diamond Obelix (Sarah McLean), Louise Houston’s DRUMILLAR HEYDAY (Louise Houston), Sarah Kinnear’s Dstud Midget Gem (Sarah Kinnear), Morris G Smyth and Elaine Smyth’s Elamo Cobras Diamond Girl (Hannah Agnew), Aedi McCaughey’s Hariness (Aedi McCaughey), Lisa Corry’s Inishcruise (Lisa Corry), Joanna Curran’s Intis (Joanna Curran), JP McGranaghan’s KEC Harrison (JP McGranaghan), Paul Caves’ Kinmar Piloth (Paul Caves), Amanda tinney’s Knockbrack Diamond Lady (Melissa Tinney), Sheikh Samir Mirdad’s Mirdads Fareeedat Alrahmaaan (Sheikh Samir Mirdad), Sheikh Samir Mirdad’s Mirdads Maaa Shaaa Alllah (Sheikh Samir Mirdad), Sheikh Samir Mirdad’s Mirdads Zamzaaam (Sheikh Samir Mirdad), Denise Owens’s Omard Connery (Aoife Owens), James Hogg’s Pokerface JS (James Hogg), Karen Pearson’s Quantum Classic (Karen Pearson), Avril Gibson’s SGS Miss Cobra (Stephen Gibson), Thomascourt Stables’ Thomascourt Darco Q (Mervyn Jr Clarke), Alan Ivan Mccoosh’s TMSH Chance R (Trudie Hermione McCoosh), Mervyn Clarke Jnr & Johnny O’Hanlon’s Ultimate Quality (Mervyn Jr Clarke), Laura Ervine’s White Hawk Shakara (Laura Ervine). 1.10m - 1, Tom Treanor’s Zentus T (Mary McShane); 2, Eavan White’s O’Harabrook (Fiona Thompson); 3, Philip G L White’s Texan Style (Tegan J White-McMorrow); 4, Tracey Howell’s Ferros Kandy (Rachel Moore); 5, Charlotte Eakin’s Ursus (Charlotte Eakin); 6, Morris G Smyth and Elaine Smyth’s Elamo She’s The Business (Hannah Agnew). 1.20m - 1, Jim Maneely’s Amigo VH Winkenshof Z (Hannah Maneely); 2, David Robinson’s Premier Domino (Melissa Tinney); 3, Katie McDermott’s King Diamond (Charlotte Harding); 4, Philip G L White’s Texan Style (Tegan J White-McMorrow); 5, Rosemary Bothwell’s HHS Cheers (Nicholas Bothwell); 6, Eugene Woods’s Craigmore Cruising (Patrick Garvey).